Minnesota is hockey country, no question about that. There are over 200 past and present NHL players from here, and the University of MN (Minneapolis and Duluth) have produced dozens of pros as well over the years. And the further North you go, the more prevalent hockey is. Moorhead, Thief River Falls, Roseau, Warroad, Virginia, Eveleth, and plenty of other towns have long been associated with the sport, given the cold weather climate. 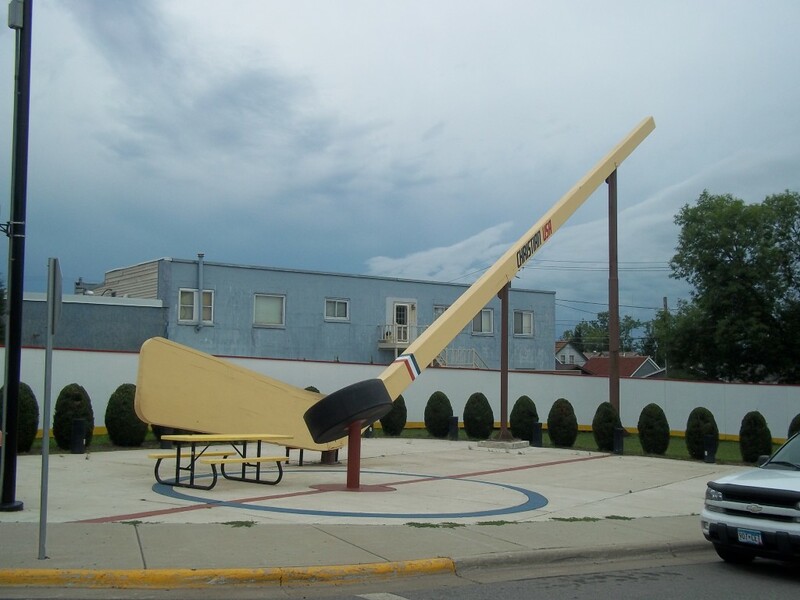 Here in Eveleth, MN, aka “Hockeytown, USA,” stands the World’s Largest Hockey Stick. Tipping the scales at over 3 tons and 110-feet tall, it’s found in right downtown along with a 700-lb puck. It was originally erected in 1995, but the original fell into disrepair after a handful of rough Minnesota winters. 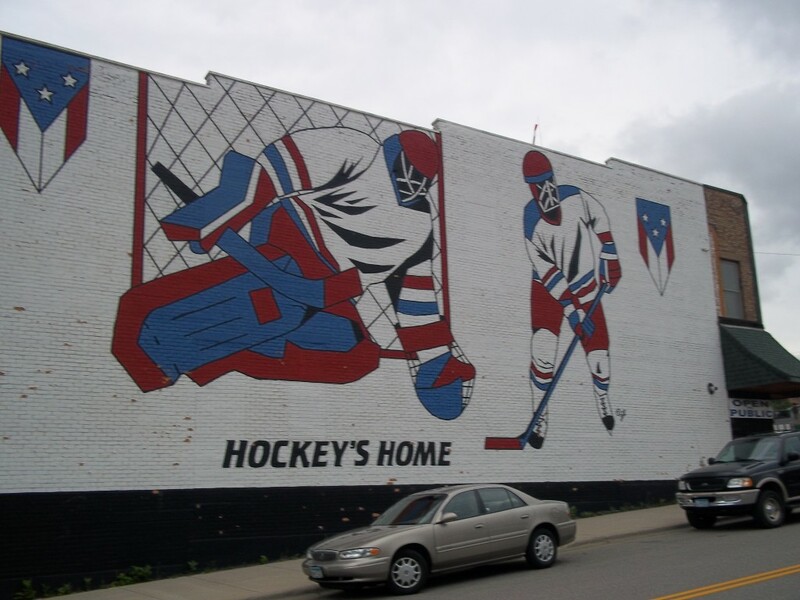 So, in 2002, a new one was put up, complete with the Christian Hockey Sticks logo on the side. (Christian Brothers Hockey Sticks are made in Roseau, MN and the company was originally founded in Warroad, MN by ex-NHL players and US Olympic Gold Medalists Roger and Bill Christian). So it’s no surprise that the Big Stick would be labeled with a homegrown brand. Also here in Eveleth, just across the street from the colossal piece of sports equipment, is the United States Hockey Hall of Fame. This museum features everything you’d expect a hockey museum to have, such as a wall of fame, interactive exhibits, different hockey artifacts, and stats galore. Although Eveleth is a small town, it has a pretty cool little downtown area and is located in the heart of the Iron Range. While in the area: I have covered things to do on the Iron Range in past posts, and outside of town is the Leonidas Mine Overlook, an incredible view of the open pit mine which at first glance looks more like a scenic mountain vista. This entry was posted in Highway Highlights and tagged Hockey, Iron Range, Minnesota Marvel, Roadside Attraction, World's Largest by Seth5544. Bookmark the permalink. That’s one BIG stick. Unfortunately for the American Hockey Hall of Fame, it can’t lay claim to the world’s largest hockey stick & puck. Perhaps America’s largest. WHILE THE ABOVE COMMENT HAS A VALID POINT, THE GUINNESS BOOK OF WORLD RECORDS REJECTED THE CANADIAN STICK AS THE BIGGEST BECAUSE IT WAS NOT A REAL HOCKEY STICK, AS THIS ONE IS. THE ONE IN CANADA IS MADE FROM PLYWOOD. SO THIS ONE IS TECHNICALLY THE WORLDS LARGEST HOCKEY STICK.